Capricorn Personality #003 | Capricorn Life - Capricorns Rock! Capricorns are often polite but have strong opinions. 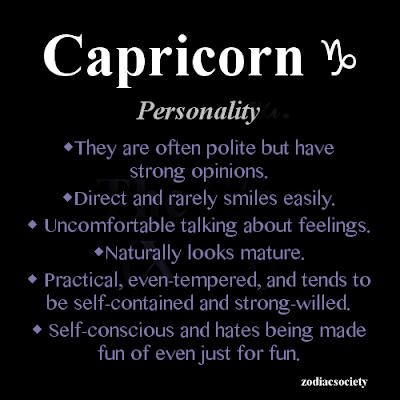 Capricorns are direct and rarely smiles easily. They are uncomfortable talking about feelings. Capricorns naturally look mature. They are practical, even tempered, and Capricorns tend to be self contained and strong willed. Capricorn is self conscious, and hates being made fun of even just for fun.